X3D Technologies has created a projection system for three-dimensional product advertisements. The system was recently demonstrated at the International Nightlife, Bar Beverage and Food convention in Las Vegas earlier this month. The system was used to project a "virtual beer" that appeared to sit right on the bar in front of patrons. 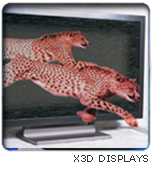 "X3D takes an off-the-shelf plasma screen television, removes the front layer of glass and inserts a grid of red and green filters separated by opaque lines on top of the screen's pixels. The filters are spaced so that light rays leaving a certain pixel pass through a green filter to get to one eye, but a red filter to get to the other eye. The spacing is based on a measurement of the average distance between a pair of eyes. Software then splits the video to be projected into two slightly different images, one blocked by the red filter, one by the green. Myles Owens, chief executive officer of X3D, says that he dreams of the day when this technology will find its way into the homes of ordinary consumers. "We continue to strive for broadcasting 3D content. That is the future of advertising," he says. Alfred Bester, author of the award-winning novel The Stars My Destination, has already seen this future, and has walked right through it. In his 1974 novel The Computer Connection he writes about exactly the same system of three-dimensional advertising - he calls the ads projection commercials. And yes, he puts this technology to use in the same place, a pub. The X3D system has other applications; it can also be used in the medical field. A doctor can plan surgical interventions with 3D models using real three-dimensional visualizations created from MRI data.